Why should I stop saying certain words when it comes to sales? 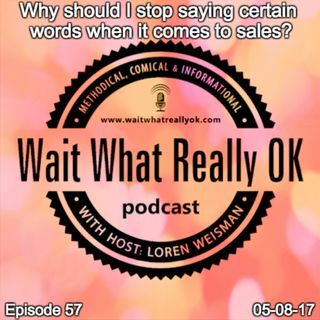 Wait What Really OK Podcast Episode 57 hosted by Brand Precision Marketing Strategist and Counselor, Loren Weisman has words with words that we should all be removing from our sales and pitches both verbally as well as in written materials. These should also be removed from our social media posts and especially the headlines. We are in a war of words with so many overused and fluff words that have become so commonplace and ... Más informaciones oversaturated. By putting bin that extra effort to remove the words that are overused and work our pitches, headlines, and discussions with a greater authenticity and authority, it can help to stand out in a sea of junk. On top of it, you have many people using these words and phrases to cover up what they don’t know. So why should I stop saying certain words and phrases? Because I want my message to be taken seriously and heard authentically. I believe you would want the same. Podcast Blog Supplement for Episode 57 of the Wait What Really OK Podcast with Loren Weisman. Podcast Link Supplement for Episode 57 of the Wait What Really OK Podcast with Loren Weisman. How can less be more when it comes to marketing online? Podcast Video Supplement for Episode 57 of the Wait What Really OK Podcast with Loren Weisman. Podcast Photo Supplement for Episode 57 of the Wait What Really OK Podcast with Loren Weisman.